There’s never a bad time to think about conservation and helping out wildlife. As a matter of fact, late winter, maybe more than any other time of the year, wildlife—especially birds—can use your help. You may be saying, “Birds can fend for themselves; they have instincts which enable them to find their own food and shelter. Why do I need to help them?” You would be absolutely correct, they do have the instincts necessary to find shelter and food, but what harm is there in assisting them? Would there be any negative effects to providing some extra branches or shrubs in a corner of your homestead to provide shelter for some little critter that may otherwise be exposed to the cold of winter or the sweltering heat of summer? Of course not, and this is just one of the awesome benefits of becoming a Certified Wildlife Habitat. Another benefit is that you get to see the wonderful and colorful variety of birds that will visit on a regular basis at your feeding spot. Northern Cardinals and various finch varieties. The first thing that we need to discuss is what is a wildlife habitat? While there may be differing definitions, my family has chosen to go by the definition given by the National Wildlife Federation, a large conservation organization whose main office is located in Virginia, with 51 regional and affiliate offices around the country. It began in 1936, and according to their website, is now the oldest and largest conservation organization. 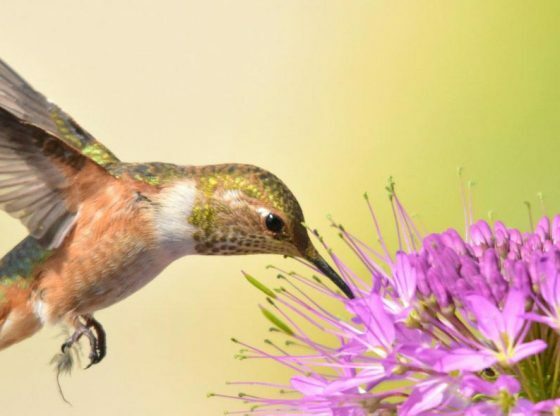 The criteria for creating a Certified Wildlife Habitat are that you provide food, water, cover, places to raise young and that you are using sustainable practices, which pretty much sounds like the homestead most of us are familiar with in the first place. Let’s look at the criteria in a little more depth to help you determine if your homestead is already “certifiable” or what easy changes you could make to benefit nature. You can find exactly what is required in each of these areas by visiting the National Wildlife Federations website. Arguably the most important aspect of a wildlife habitat, or sanctuary as some would call it, is food. Everything that is living needs food, that’s a given. I have heard many people say, “But I can’t afford to purchase birdseed every week to keep the birds in my yard fed.” I agree birdseed can be a large financial commitment if you were to try to feed the birds every day, every time the backyard birdfeeder was empty. 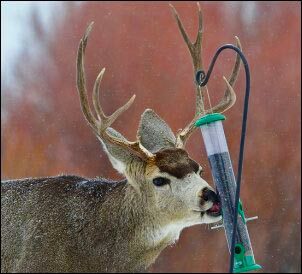 I have the advantage of living on a “suburban homestead”, so I do not have acres of land and, therefore, only have a couple of feeders that I fill on a regular basis, like once every other day. I also try to wait until birdseed goes on sale and then I stock up. I purchase suet or peanut cakes for less than a dollar each and these tend to last me at least a week, and that is when the bird traffic is at its highest. 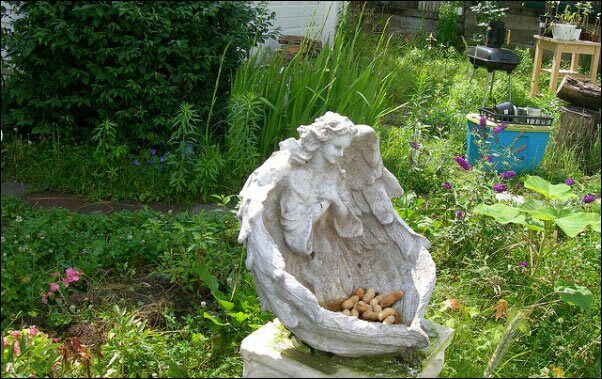 Besides the provision of bird food, one can, of course, plant native flowers, shrubs, and trees on their homestead. These will provide food in a variety of ways. Berries, nuts, shoots, and leaves to name a few. Not to mention the nectar from the blooms on many plants during the spring and summer. If you have fruit-bearing trees, that becomes an excellent source of food. Insects that make their way to the native plants and fruits also provide a great source of nourishment. Remember, you are building a backyard habitat for more than just birds, it is for rabbits, squirrels, chipmunks, raccoon, and any other critter that may meander through your yard. (Of course, I will admit there has been more than one occasion I actually tried to chase a rabbit out of my vegetable garden, and I question the sanity of trying to provide anything in my yard that they would want.) I also like to leave dead branches and logs laying on the back part of my yard, beside the compost pile, this provides not only much-needed shelter (which we will discuss a little later on) but will provide for certain fungi and mosses to grow on, enabling even more diversity in the habitat. The second criterion is a source of water. While this may not be an issue for people who have a creek, stream, river, pond, or lake on their property, it may be something that has to be thought out for others. For me, the only water that we have on our property is actually on a neighbor’s land, and it is just standing water that sits almost year round. It really is not good for anything but breeding mosquitoes (see above paragraph about food – certain birds love those pesky little things). I do not have the time to keep a birdbath clean and filled up every day, so I worked with my son to come up with an easy, clever idea to provide water. We simply dug a hole about one foot by one foot and one foot deep and placed a flower pot in it. It is a makeshift watering hole and he enjoys filling it up and letting the old water overflow. He happily carries a couple of small buckets of water we have collected from our rain catchment barrel to the watering area a couple of times a week. This may be a good time to encourage you to turn this endeavor into a family effort. 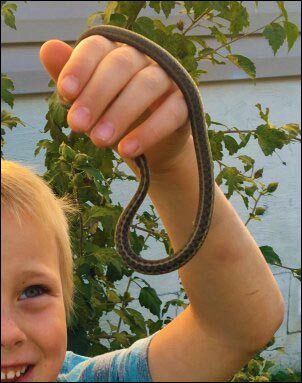 As I mentioned, my son has really caught onto the vision of a wildlife friendly yard. He has actually taken more steps to create shelters and nesting areas in our yard than I have, and he is only nine years old. He loves to watch the wildlife and learn about what he is seeing. He takes a certain pride in knowing that he has helped create this special place. 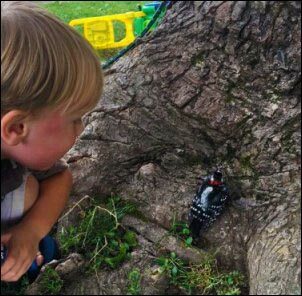 It is a wonderful experience working with the boys in the yard and seeing their faces when they spot a new bird we have never seen before or spy a rabbit munching on something that they have just thrown into our compost pile. Getting back on track now, the third criterion you will need to meet is maybe one of the easiest to provide: cover. Most homesteads have an abundance of dead or dying trees, fallen branches, brush piles, or a random assortment of what I call “farm junk” laying around that can provide the much-needed shelter for many critters. If it can protect an animal from the freezing cold and snow and ice of winter as well as provide protection from the heat of summer, chances are you are set in this area. Trees, bird and bat houses, ground covering, walls, natural wild grasses, et cetera all will provide the much-needed shelter. Fourth, you will need to provide a place for the wildlife you are attracting to raise their young. Many times this goes hand in hand with covering, but sometimes you may need to be a little more creative. A place to raise young will typically need to be more protective so it is a safe place to lay eggs or raise young. To ensure that your habitat thrives, a place to raise young is critical. Trees that you have placed birdhouses on provide excellent nesting grounds for birds. You may have a small section of your property in which you allow native grasses and weeds to grow untouched, providing a place for rabbits to burrow, as well as ground-dwelling birds. I also have found that if I leave pieces of string or scrap material close to my bird feeders around the beginning of spring, when birds are beginning to build their nests, the colorful assortment disappear quickly and I can usually find a nest or two with multicolored weaving. Lastly, in order to be able to have your habitat certified, you will need to be taking some sort of sustainable steps in your yard to make sure that the future of the habitat remains healthy and strong. Again, look at the National Wildlife Federation website for a more detailed list of what is required, but the three categories that are listed are soil and water conservation, controlling exotic species, and organic practices. Once you have taken these steps, you are now ready to certify your yard or homestead. If you want, you can stop here, knowing that you are doing a great thing for the wildlife around you. However, if you would like to make it known to others around you, maybe neighbors or friends, that is where the National Wildlife Federation comes in. You can complete an online application and submit a $20 processing fee (which is used to help support the efforts of the NWF). I have had questions about how legitimate the whole process is. I simply say that it has made a positive impact in nature, has brought my family closer together, and, even if it is a “money-making scheme”, at least the money went for a good cause. 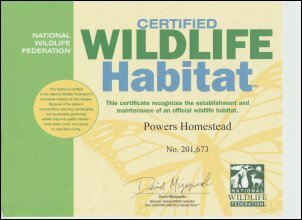 In return for you certifying your homestead or yard, you will receive a nice, personalized certificate, a subscription to the NWF’s online newsletter, a one year membership to the NWF, 10% off anything in their magazine, as well as the option to purchase a yard sign that shows the world that you have taken the above steps to create a Certified Wildlife Habitat. It is a small price to pay for the undeniable benefits that nature, and you as well, will reap.